High quality and very detailed 1/64 scale (2.5" long) diecast. Hurry - limited production. Very cool 1/24 scale (7" long) diecast with opening doors from Jada. 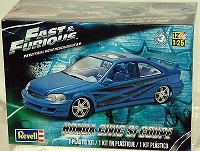 Great 1:18 scale diecast of the Super Street Honda Civic. Approx. 10" long with engine detail. Awesome 1:18 scale (10" long) of a Honda Accord! This is the ONLY 1:18 scale diecast ever produced of an Accord. Click for more photos. We can offer this great price because WE WROTE the book. This is the best selling Honda book of all time. This volume focuses on the 1984-1999 Hondas and Acuras, plus it will be signed by the author. Click for more info and photos. 1:18 scale (8" long) diecast car model - highly detailed and includes a free Motocompo Scooter that fits in the rear hatch! Unbelievable footage - features the Nissan Skyline as well as many more of your favorite sports cars.